The unfortunate reality of yesterday’s lunch was this: the food did not tip the orgasmeter as I hoped it would. The amuse bouche was all right, though its presentation and the explanation given by the server were disappointing. The butternut squash soup was tasty, but the fact that it was barely luke warm did nothing to impress us. And the mussels mouclade and spinach mousse wasn’t delivered, at least not for all of us. My sister-in-law and I both were served a version of the dish in which scallops substituted for mussels. Not bad, mind you, but after tasting my wife’s dish, with mussels, ours was a distant second in flavor (especially since the menu that drew us to the place specified mussels). The real disappointment was the beef Wellington; overcooked, oddly “personalized” with individual pieces of meat wrapped in a pastry shell. Ah, well, it could have been worse. 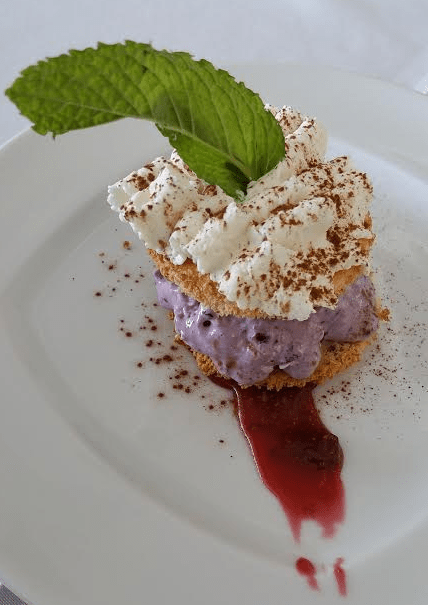 The advertised dessert, crème brûlée, did not materialize; a substitute involving blue berries, whipped cream, cookies , and a smear of strawberry jam, all of which were almost hidden under a giant mint leaf, was acceptable, though. The best part of the day was the odd coincidence that my sister-in-law and I dressed as twins. 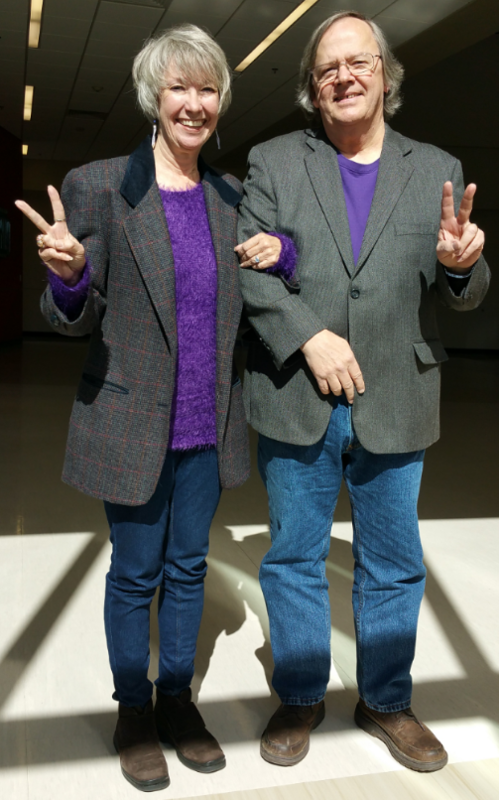 Completely unplanned, we both wore grey jackets, purple shirts, jeans, and brown shoes. It was as if the universe was speaking to us; “you are soul mates, my friends, and I am dressing you alike so you will see just how well you fit one another.” Well, we DID wear similar clothes. And the colors were so damn close. I mean, how could it be that we both wore grey jackets? My favorite wife was behind the camera, capturing the coincidence for posterity. Coincidence on steroids, I say. My favorites were The Muppets (written by Sam Pottle & Jim Henson, I learned after the show) and the Peanuts theme music, written by Vince Guaraldi. I am enamored of everything I’ve heard that Guaraldi wrote (Cast Your Fate to the Wind is, perhaps, my all time favorite). The six-man band playing the music was exceptional. Nathan Carman, the young saxophonist, is an incredibly talented guy who, in my view, really shows what the sax can do. Garry Henson played trumpet; when he got really wound up, he was on fire. Dr. John Leisenring was mesmerizing as he played the slide trombone. David Higginbotham, who we’ve heard several times before, played the standup bass like a pro. And the drummer, Paul Stivitts, along with the keyboardist and band leader, Clyde Pound, sewed the group together seamlessly. Several of these guys (Higginbotham, Pound, Stivitts, and Leisenring) are playing next Sunday at the Valentine Morning Jazz Service (“New Orleans and Up the River”) at the Unitarian Universalist Village Church; we’ll be there. All right, I’ve devoted entirely too much time to yesterday and later this week and not enough time to writing a short story contest entry and a piece for next week’s writers’ critique group meeting. After another cup of coffee, I will get to work. But I wanted to document coincidence and good times, first. And so I did.